Thanks to contributor Alex R. from a major connector manufacturer, we have now have a spreadsheet that can calculate parameters for multi-dielectric coax, beyond just two dielectrics! If you want to download Alex's spreadsheet, go to our download area and look for a spreadsheet called Multi-dielectric_coax_Rev1.xls. Alex solved the equations for two, three, four and five different layers of dielectric. If you need more than five dielectric layers, you are on your own, but if you modify the spreadsheet, send it back and we might post your version too! One of these days we will fix up the graphics on this page, but don't hold your breath. You can skip all the boring math and get your answer by using our dual-dielectric coax calculator! Note that because the ln(D/d) term is a ratio, you can just as well use ln(R/r), and in either case the dimensional units don't matter. 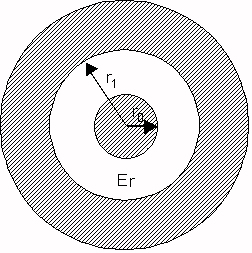 The "trick" to doing the multi-dielectric calculation is to note that capacitance of multiple concentric dielectrics can be easily be calculated by adding their individual capacitances in series. The coax inductance calculation does not change no matter what dielectric you put between the center and outer conductors. To calculate the static capacitance between the inner and outer conductors, imagine a zero-thickness conducting cylinder placed inside the cable, at the interface between the two dielectrics. 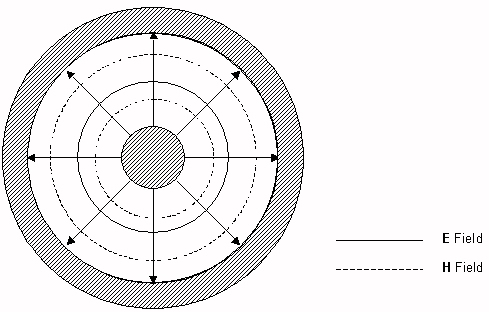 Since all of the electric field components are already perpendicular to this interface, this does not violate the boundary conditions of the initial problem. With this conducting cylinder in place, two capacitance values can now be calculated: 1) the capacitance (per meter length of cable) between the inner conductor and the cylinder; and 2) the capacitance between the cylinder and the outer conductor. The capacitance per meter of cable between the inner and outer conductors is then the series combination of the above two capacitance values. As seen from the numbers, the expressions for the static Z0 and Keff are valid at low frequencies, and for the dimensions used in this example, the dispersion is mild below 15 GHz. 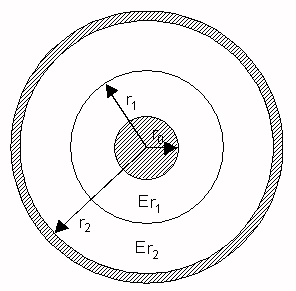 Smaller dimensions and closer values of Er1 and Er2 would reduce the dispersion further. The derivation of the expressions for Z0 and Keff in the case in which the division between Er1 and Er2 is angular, rather than radial, is probably more complicated.